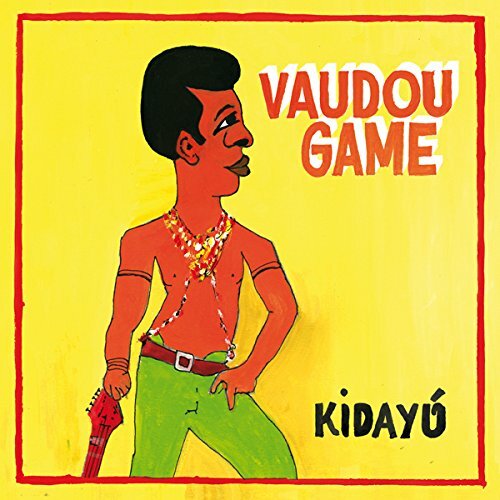 Arriving from the distant shores of Benin and Togo via France, Vaudou Game are an international affair. Led by the distinctive presence of African singer-songwriter and composer Peter Solo, the five-piece afro-funk band are made up of French musicians and produce fast-paced rhythms based on the ideas of ‘Vaudou culture’ or ‘Voodoo’ to me and you. It’s this mysterious, supernatural element that serves as a lyrical and conceptual basis for Vaudou Game’s second album Kidayu. The term Kidayu translates as ‘sharing’ in Kabye, the language of Northern Togo. This is dialect spoken fluently by frontman Peter Solo, an enigmatic, yet established figure within contemporary African music. Beginning life as an orphan, Solo began to take an interest in music from a young age, fashioning instruments out of anything he could find on the streets. This DIY nature is reflected in Vaudou Game’s obsession with old forms and the historical context of Voodoo itself. It’s no mistake that Kidayu sounds a lot like an artefact of a bygone era, made using cassette tapes and vintage instruments. Vaudou Game are ardent future deniers, deflecting ‘digital corruption’. Throughout the album’s 11 tracks, classic genres are spliced together in a complex jigsaw of sounds. It’s a kind of head-bobbing ritualistic experience, hypnotising your limbs to jerk into spontaneous dance. The use of phrases sung in honour of divine, god-like beings narrates a journey through Solo’s native Togo. These superstitious lyrics which describe the many places and people that have influenced Solo, become liberating shouts of joy, given life through a diverse musical landscape of blues, soul and afrobeat played to a tight tempo. Album opener, ‘Natural Vaudou’, is a fantastically bright and forceful introduction to the sound of Solo’s captivating heritage, with his mother-tongue riding shotgun on a single shimmering guitar hook that never catches breathe. Tracks like ‘Ndi’ proceed with the free-spirited nature of old-school funk, which bodes well with Kidayu’s spontaneous nature, happily infusing elements of flamenco and big-band into its cacophony of established sounds. Guitars are a major feature of the band’s makeup, delightfully warm and tuneful, bubbling away under skipping rhythms and smooth brass parts. Although Kidayu is mainly a work of cultural African music, it contains many familiar, acoustic ingredients and arrangements that an outsider can appreciate. Solo’s sporadic vocal grunts and speedy ad-libbing channel James Brown’s, possessed vocals bodes well with an infatuation with 70s funk and soul sounds burned into the album’s lifeblood. A mix of Solo’s native dialect and French is uttered throughout, only breaking into barely decipherable English on the slapped-up funk protests of ‘Revolution’, with yells of “Say Something!” repeated like a political slogan. One of the strongest moments comes in ‘On Se Pousse’, a brilliantly warm track steeped in Gypsy Kings-like chanting and wailing, held up by tinkering drumbeats and fiddly guitar lines. The juxtaposition between the dark concept of Voodoo and the band’s wholesome sound is almost undetectable, which makes for an intriguing listen. Kidayu presents an image of freedom and untamed spirituality, where heritage and culture celebrate itself in a universal dance. It’s a deeply infectious concept. Togo and its archaic rituals might be a world away, but Vaudou Game’s valiant second effort brings out the spirit of Voodoo in all of us.